The beetroot is the taproot portion of the beet plant, usually known as the beet, also table beet, garden beet, or red or golden beet the world over. It is several of the cultivated varieties of Beta vulgaris grown for their edible taproots and their greens. These varieties have been classified as B. vulgaris subsp. vulgaris Conditiva Group. Other than as a food, beets have use as a food coloring and as a medicinal plant. Many beet products are made from other Beta vulgaris varieties, particularly sugar beet. The usually deep purple roots of beetroot are eaten either boiled, roasted or raw, either alone or combined with any salad vegetable. A large proportion of the commercial production is processed into boiled and sterilised beets or into pickles. In Eastern Europe, beet soup, such as borsch, is a popular dish. In Indian cuisine, chopped, cooked, spiced beet is a common side dish. Yellow-coloured beetroots are grown on a very small scale for home consumption. Beetroot can be boiled or steamed, peeled and then eaten warm with or without butter as a delicacy; cooked, pickled, and then eaten cold as a condiment; or peeled, shredded raw, and then eaten as a salad. Pickled beets are a traditional food in many countries. Although it is not very popular, but red beet is often called superfood. Its benefits have been known for centuries. Initially red beet has gained fame because of the high sugar content in its roots. Dark red beet roots can be eaten raw, grated in salads, boiled or roasted. Another common way for consumption is beetroot juice. It is naturally sweet and very healthy. 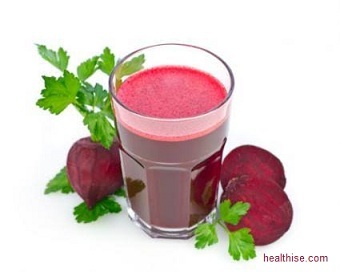 To enhance the effect of beetroot juice, to improve the taste, you can add an apple, carrot, and some herbs. Beetroot has a high content of folic acid and manganese. Its leaves are an excellent source of vitamin A, C and K. Other valuable substances, which are contained in it, are calcium, iron, potassium, copper, sulfur, silicon and chlorine. Their beneficial effect on the body is : improving the composition of blood, stimulating the production of red blood cells, increasing hemoglobin levels and supplying cells with oxygen. The juice of red beet is one of the richest sources of nitrates. It contains D and alpha amino acids, which helps body in the synthesis of proteins. Furthermore, this vegetable contain various antioxidants, such as flavonoids and carotenoids. Beetroot red contains pigment known as betalaine. This is a powerful antioxidant with strong inflammatory effect. The high concentration of antioxidants and phenolic compounds protects against disorders of cell structure, and fight free radicals. According to several studies contained in beetroot betaine, is a powerful remedy in fight against cancer. 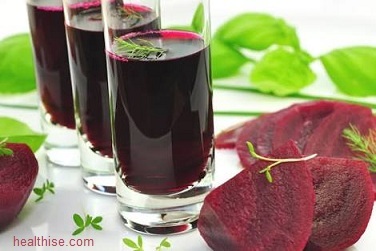 Some ingredients in beetroot juiceprevents the formation of carcinogenic tumors and cleanses the body of harmful toxins. There are a lot of cases of remission in patients suffering with leukemia, skin cancer, lung, breast and prostate. It has a great impact on cancer of the stomach. Betaine has good influence over skin and liver tumors, also it is recommended to smokers to dispose of body cancerogenic agents. Pure oxalic acid in red beet is known as a good solvent for calcium accumulation in body, which is considered as a major cause of chronic diseases. Regular consumption of beetroot juice is recommended for arthritis and varicose veins. The juice of beetroot is an excellent remedy for regulating metabolism. It clears intestines, improves their functioning and enhances peristalsis. It helps people, who suffer from hipohlorhidriya (lack of hydrochloric acid in gastric juice, resulting in digestion problems). Beetroot juice is very useful for pregnant women, because of the high content of folic acid. Folic acid (B9) is essential for proper formation of the tissues of the fetus, and reduces the risk of injuries to the baby’s brain (anencephaly), or spine (spina bifida). Beetroot is a good source of carotenoids like lutein and tseaksantin. These two components are particularly useful for health of the eye and particularly of the retina. Drinking beetroot juice improves physical condition of the body and reduces fatigue during exercise. Increases energy and stamina in people whith up to 16%. 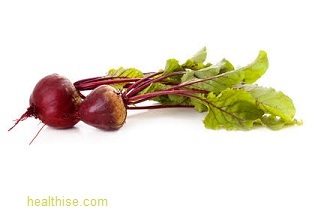 This is due to the fact that red beets helps for optimum utilization of oxygen by the cells. A daily cup of beetroot juice can lower high blood pressure. Studies clearly show a decrease in blood pressure, particularly systolic pressure. Also beetroot juice lowers levels of bad cholesterol. A glass of beetroot juice improves flow of blood to the brain and slows age-related diseases. In older people, beetroot helps to maintain an active life,widens blood vessels and reduces the amount of oxygen muscles need. Beetroot juice is rich in antioxidants and iron, which are important for good blood supply. Iron is recommended for people disposed to anemia, low hemoglobin. Beetroot enhances the absorption of iron by the cells and their ability to carry oxygen. Nitrate in beetroot in the body are converted to nitrites, which open blood vessels and increase the flow of oxygen to the body. Betaine stimulates the functions of cells and protects the liver and bile. Beet fiber increases synthesis of detoxifying enzymes. Beetroot juice strengthens immunity and successfully fights inflammation. It reduces fatigue – gves a sense of vitality and vigor. Magnesium reduces tension in the muscles and eases stress. The juice is particularly useful for people suffering from Epstein-Barr virus (a virus from the group of herpes viruses, which are prone to people suffering from chronic fatigue syndrome). Beetroot is high in fiber and low-calorie, making it an ideal food for people who want to lose weight. It believed, that the juice of beetroot helps with toothache, menstrual pain, headache and backache. Red beet is great for skin – according to legend, Aphrodite ate beetroot to maintain its beauty. Regular consumption of beetroot juice provides the body with the necessary nutrients to enjoy healthy and beautiful skin and hair. The juice of beetroot cleanses blood, releases body of toxins and excess water and the result is – shining skin.. The juice can be applied externally for nourishing and moisturizing. Regular consumption helps regeneration processes. Because it contains powerful antioxidants beetroot red protects skin from premature aging by neutralizing free radicals. According to some studies, regular intake of beetroot juice, reduces up to 60% fine wrinkles and lines on the skin. The juice contains lycopene, which keeps the skin supple and protects it from harmful effects of the sun’s rays and thus protects us from sunburn and skin cancer. Beetroot juice can be used as a face mask – in combination with clay or carrot juice. It cleansing and bleaching it, if done regularly for a month. Beetroot contains carbohydrates, protein, potassium, phosphorus, calcium, vitamins B and C. All these nutrients and minerals provide good blood flow to the scalp, which in turn, means healthy and shiny hair. The juice of beetroot helps if have itching and dryness of the scalp. Its enzymes destroy accumulated dead cells and soothe the scalp. Acting moisturizing and relieves itching with dandruff. The combination of beetroot juice and vinegar cleanses scalp of dandruff and sometimes helps with psoriasis. Beetroot juice can be mixed with henna to get beautiful brown tone. Because it is completely natural dye, it will not damage hair – on the contrary, itwill nourish and strengthen. 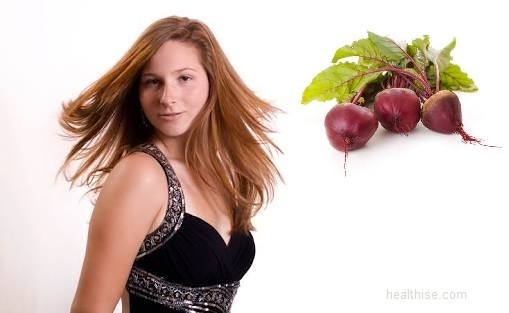 For light reddish hue, you can rinse your hair with pure beet juice. Carotenoids in red beets strengthen and thicken the hair. They reinforce blood circulation, thus necessary nutrients reach the follicles and hair growshealthy and shiny. Massage with a mix of beetroot juice and ginger is a great remedy for hair loss and baldness. Has a laxative and diuretic effect. Excessive consumption may cause stomach troubles. 1 or 2 cups fresh beetroot juice can dramatically lower blood pressure and cause dizziness and weakness. People suffering from hypertension (state of increased hydrostatic pressure in vessels or cavities in hollow organs) and stones in the urinary system, should refrain from consumption of beetroot. Intake of concentrated beetroot juice can cause diarrhea, so dilute it with apple, carrot or water. People with kidney problems and gall should not drink beetroot juice, because it can lead to deterioration of their health. Beetroot juice can cause allergic reactions such as fever, rash, itching. If you notice any of these symptoms, consult a doctor. Beet stains can be cleaned with a mixture of vinegar and baking soda – mix to obtain gruel, apply firmly on the stain and leave for 10 – 15 minutes. Then rub well and rinse.